HKC Roofing is Cincinnati’s asphalt shingle expert! A high-performance Asphalt Shingle roof takes more than just shingles. The performance of an asphalt shingle roof depends on an entire system of roofing accessory products working and performing together, including ventilation, hip and ridge shingles, underlayment, and attic insulation. HKC Roofing installs, services and repairs asphalt shingle roofs in Cincinnati and Northern Kentucky. We’re certified by the major manufacturers to provide extended warranty periods on labor and materials, up to 50 years! More details on these important roof components are listed below. 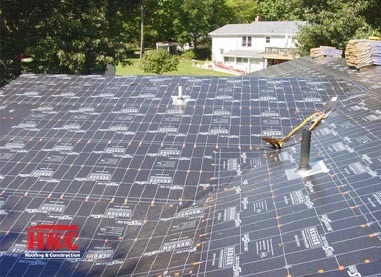 Underlayment serves three important functions: It serves as a temporary waterproofing while the new roof is being installed, it enables the roof system to achieve a “Class A” fire rating, and it protects the asphalt shingles from potential resins in the wood roof deck that can destroy the shingles. Underlayment is not designed to prevent leaking once the roof is installed. The theory that thicker felts and improved underlayments stop leaks is simply a myth. If water has breached the roof system then you will see signs of it eventually regardless of the underlayment chosen. Remember, roofs have been installed for thousands of years, many of which did not have underlayments, and they lasted for a century or more. It’s imperative to enhance the design of the system to maintain a long-term, watertight roof. 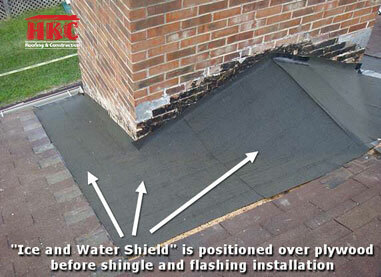 Ice and Water Shield helps protect the roof deck against water intrusion resulting from ice damming. As of January 1, 2013, the Residential Building Code of Ohio mandated that ice and water shield be installed along the edge of the roof. It is important to note that ice and water shield is NOT designed to prevent ice dams. Ice damming is caused by a lack of insulation and/or attic ventilation. Ice damming occurs when hot air escaping the living space enters the attic and warms the underside of the roof deck. The snow melt runs down the roof and re-freezes at the eaves of the roof creating the ice dam. The ice dam causes the liquid water to sit on the roof for a prolonged period of time until it backs up underneath the shingles and leaks inside. Flashings are the most important part of the roof. So often details are overlooked and almost always it shows up in the flashing work. Flashing is the metal that prevents water from leaking into the house around details such as chimneys, walls, pipes and vents. At HKC we use heavy 26 gauge Rezi-Bond steel as our baseline material. We also offer copper, lead-coated copper and stainless steel as an upgraded flashing material. We take the extra step to solder all of our flashings to make them watertight for many years to come. Ventilation is an integral part of your home’s roof system. Two parts make it a success, intake venting and exhaust venting. 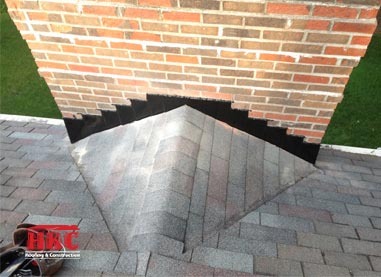 Intake venting occurs at the eaves (gutters) and exhaust venting occurs at the ridge (highest point) of the roof. A proper ventilation system is balanced, meaning 50% of the air flows in through the intake and 50% flows out through the exhaust. 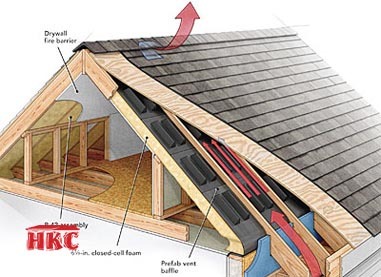 HKC has the technical know-how to calculate a proper ventilation system based on the size of your attic space. 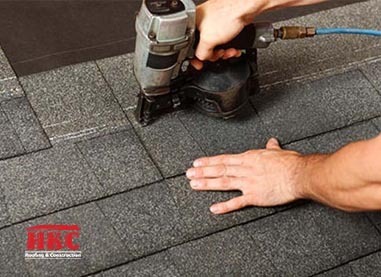 HKC is certified with the largest and most respected shingle manufacturers in the industry. While many shingles look nearly identical, it’s important to have a professional show you the differences. There’s a good reason why many roofs experience damage during winds while others are left in pristine condition. We are excited to share our experience in the industry and recommend a lasting shingle roof for your home or business. HKC operates out of a 14,000 square foot facility here in Cincinnati. We have invested in industry leading equipment, tools, and personnel. Our facility allows us to provide our employees with ongoing training. All of our jobsite foreman’s have a minimum of 15 years experience as a roofing professional, a standard we’re committed to maintaining. 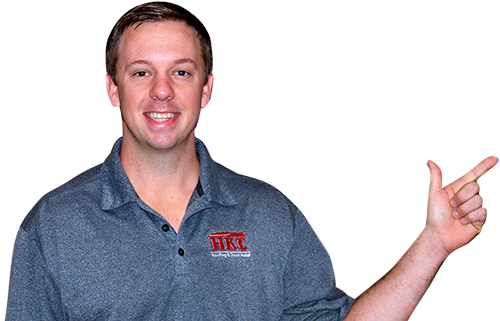 HKC is certified at the highest levels with both Certainteed and Owens Corning. These certifications allow us to offer 50 year labor and material warranties backed up by the manufacturers.